The jackhammer outside the window, the honking horns -- for many of us, loud noise can be a source of stress or a frequent annoyance. Heavy road traffic, loud office conversations, live music concerts, noise from construction sites or even loud telephones can cause generalized discomfort, difficulty sleeping and irritation. Now, new research suggests that such noises might be linked to an increase in your risk of heart disease. A new study released today in the Journal of The American College of Cardiology shows that noise pollution may have a significant impact on cardiovascular health. Researchers in Germany and Denmark reviewed years of data and looked at former studies to determine if a link exists between noise and heart disease. People and animals who were exposed to frequent, loud noise had higher rates of heart failure, irregular heart rhythms, high blood pressure, high cholesterol, and high blood sugar. The researchers believe that noise pollution causes a surge in stress hormones, which appear to have harmful effects on the arteries in the heart and the rest of the body. While this new research cannot prove that noise causes heart disease, it does provide convincing evidence that stress, especially when it is generated by noise, is linked to big consequences for our health. Lead author, Dr. Thomas Münzel from the University Medical Center Mainz Center of Cardiology explained that noise pollution should be considered a risk factor for heart disease, similar to that of high cholesterol or obesity. “What we know is that if you already have pre-existing risk factors for heart disease, such as high blood pressure or diabetes, noise will amplify that risk,” he said. 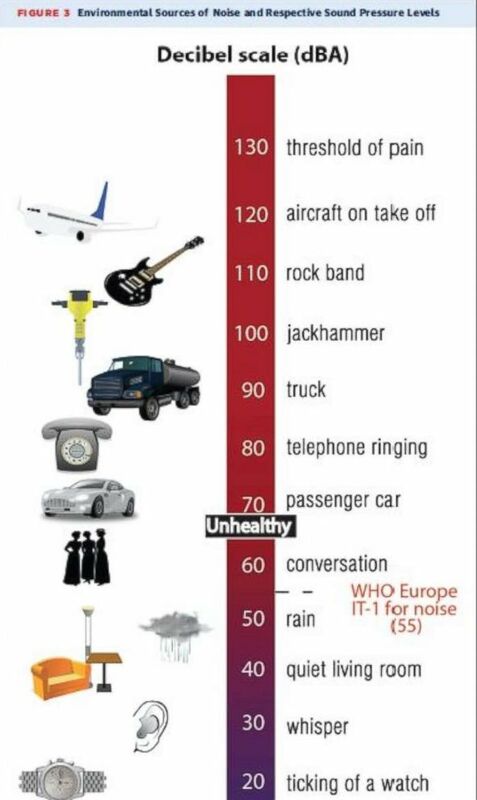 The Decibel Scale by the World Health Organization. This shows common noises and the amount of noise they produce measured in decibels. Note that anything above 60 dBA is considered unhealthy. Common noises that are around 60 decibels include a conversation in an office, the sound of a dishwasher or the noise made by an air conditioning unit. By contrast, the noise from a jackhammer is usually around 100 decibels and an airplane on takeoff can be as loud as 120 decibels. But there is no clear consensus on how much noise is considered to be dangerous for the heart. “We need more research to determine what duration of exposure to loud noise is harmful, but we do know that the risk comes from years and years of exposure, not days,” Münzel said. What does this mean for you? If you are exposed to loud noises frequently, you can consider wearing earplugs or noise-canceling headphones. This might be especially important to consider if you work in a loud environment such as a construction site or if you live near an airport and hear planes taking off throughout the day and night. It is important to note that there are no studies that have shown a reduction in the risk of heart disease because of headphones or earplugs.